Mary Anning was a pioneering palaeontologist and fossil collector. Her lifetime was a constellation of firsts. Mary Anning was born in 1799 in Lyme Regis, in the southwest English county of Dorset. Lyme Regis is now part of what is now called the Jurassic Coast, and discoveries are still being made to this day. While Mary was growing up, George III was king, the war between the British and Napoleon's French army was raging on and Jane Austen had written Sense and Sensibility. The Anning family were religious dissenters - Protestants who separated from the Church of England - and very poor. Out of nine or ten children, only Mary and her older brother, Joseph, survived to adulthood. Mary's father, Richard, was a cabinetmaker and amateur fossil collector. By the time she was five or six, Mary was his fossil-collecting sidekick - an otherwise unfathomable activity for Georgian girls. Richard taught his daughter how to look for and clean the fossils they found on the beach, and often displayed and sold them from his shop. Like many women and girls in Lyme Regis at the time, Mary had little formal education. She was able to read, however, and taught herself geology and anatomy. Richard died suddenly in 1810, from tuberculosis and previous injuries. Joseph took up a post as apprentice upholsterer and their mother, Molly, encouraged Mary to help pay off the family's debts by selling her finds. Lyme Regis is especially rich in ammonites (which were then called 'Ammon's horn') as well as belemnites ('devil's fingers'). During the Napoleonic Wars, civilians were encouraged to holiday near home rather than abroad, so tourists flocked to seaside towns such as Lyme Regis. Around this time fossil hunting was also gaining traction. This pastime was perfect for fashionable Georgians seeking to add to their cabinets of curiosities. Around 1811, when Mary was 12, Joseph found a strange-looking fossilised skull. Mary then searched for and painstakingly dug the outline of its 5.2-metre-long skeleton. By the time she was done, several months later, everyone in town knew she had discovered what must have been a monster. Scientists thought this was a crocodile. At the time most people assumed that unearthed, unrecognisable creatures had simply migrated to far-off lands. By this time, Georges Cuvier, known as the father of palaeontology, had only recently introduced the theory of extinction. Charles Darwin's On the Origin of Species would not be published for another 48 years. The mysterious specimen was studied and debated for years. It was eventually named Ichthyosaurus, or 'fish lizard' - though we now know it was neither fish nor lizard, but a marine reptile. It lived 201-194 million years ago. In 1823 Mary was the first to discover the complete skeleton of a Plesiosaurus, meaning 'near to reptile'. So strange was the specimen and so quickly had the news spread that soon there were rumours that the fossil was a fake. Georges Cuvier himself disputed the find. A special meeting was scheduled at the Geological Society of London, though Mary was not invited. After lengthy debate, Cuvier admitted to his mistake. Despite her growing reputation for finding and identifying fossils, the scientific community was hesitant to recognise her work. Male scientists - who frequently bought the fossils Mary would uncover, clean, prepare and identify - often did not credit her discoveries in their scientific papers on the finds, even when writing about her groundbreaking ichthyosaur find. Even the Geological Society of London refused to admit her - in fact, they didn't admit women until 1904. In 1828 Mary uncovered a strange jumble of bones, this time with a long tail - and wings. Once again, news of her discovery travelled fast. Scientists from London to Paris theorised on this 'unknown species of that most rare and curious of all reptiles'. What she found were the first remains attributed to a Dimorphodon. It was the first pterosaur ever discovered outside Germany. The name Pterodactyl was coined later. Unlike ichthyosaurs and plesiosaurs, pterosaurs had wings and were believed to be the largest-ever flying animals. 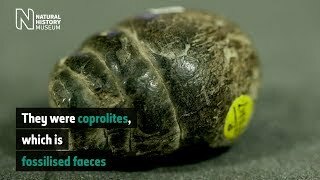 Another of Mary's contributions to science, though arguably less glamorous, is that she pioneered the study of coprolites - or fossilised poo. Mary continued to unearth fossil after fossil. She still sold her many finds, which increasingly fuelled public interest in geology and palaeontology. People flocked to fossil displays around the country - even major museums struggled to keep up with demand. Her discoveries inspired famous geologist (and childhood friend) Henry De la Beche to paint 'Duria Antiquior - A More Ancient Dorset' in 1830. He sold prints to raise money for Mary, who was still struggling to make ends meet. Duria Antiquior - complete with ichthyosaur, plesiosaur and pterosaur - is the very first pictoral representation of prehistoric life based on fossil evidence. This art form is now known as palaeoart. It helps people understand a little about life on Earth millions of years ago. Palaeoart is still popular today, from meticulous renderings used for research to dinosaur t-shirts. Mary's Plesiosaurus also inspired geologist Thomas Hawkins's Book of the Great Sea Dragons, published in 1840. Mary died from breast cancer in 1847. She was only 47 years old, and still in financial strain despite a lifetime of extraordinary scientific discoveries. Today the Natural History Museum in London showcases several of Mary Anning's spectacular finds, including her ichthyosaur, plesiosaur and pterosaur. Much like they did two centuries ago, her fossils continue to captivate visitors from around the world. And Mary's legacy lives on along the rugged Jurassic Coast - now a UNESCO World Heritage Site - where scientists, amateurs and adventurous children alike gather year-round to hunt for the next big find. Read about the upcoming biopic on Mary Anning. Visit the Fossil Marine Reptiles gallery at the Museum and see some of Mary's finds. Follow Dippy, the Museum's Diplodocus cast, on his adventure around the UK. He begins his adventure in Dorset. A campaign group have attracted national attention for their quest to get her permanently commemorated. A feature film is to be made about the fossil hunter from Dorset. Whether liaising with cannibals or escaping giant spider webs, Cheesman took the challenges of perilous fieldwork - and patriarchal views - in her stride.